Visit Ho Chi Minh City these days and eventually you will bump into Colonel Sanders. In January 2008, burning-out from the grind of four continuous years in grad school and full of unsatiated wanderlust, I happily made a return trip (only my third) to Vietnam with my father. We weren’t in Vietnam just for kicks, however. My sister was getting married back home in the States that coming summer and my Bà nôi in Sài Gòn was getting closer to her death. The trip then was part trans-Pacific shopping spree for the big wedding and part unspoken final farewell to my aging grandmother. So, between helping my father deliberate over which wedding invitation package would give him the most bang for his đồng and watching Korean soaps dubbed into monotone Vietnamese with my grandma in a frigid air-conditioned bedroom, I didn’t have too many opportunities to explore the city on my own. It was like being under voluntary and not-entirely-unhappy house arrest. At least, I thought, it wasn’t the solitary confinement of my dissertation or the gradschool madhouse. One day, however, I did manage to break free and go into the city. But soon enough, I was completely lost, trapped on some corner of a busy intersection in the congested heart of Saigon. That’s when I saw him…Or, did he see me first? Colonel Sanders! His smiling benevolent face peered out over the noisy vortex of motorbikes and cars careening into the soup of exhaust fumes, human sweat, and hot metal. Not the eyes of Doctor T.J. Eckleberg over the valley of ashes, but the smile of Colonel Sanders over the rising skyline and sinking water table of HCMC. Patriot and countryman, what are you doing here? My grandmother is dying and my sister is getting married. What are you doing here? Nothing. I never heard his reply, just a dusty droning in my ear. He continued to look blithely and blankly over the city and its multitude. I tried to read the expression on his face, framed inside the large red sign on the side of the two-story Kentucky Fried Chicken – Việt Nam across the street, a KFC bigger and more bloated than any I had seen in all of these United States of America. I followed the Colonel’s eyes. They seemed fixed on something over to my left, across the intersection and electrical wires. What was it? From what I could see, the Colonel appeared to be looking at a bird flying across a red field toward a yellow star. I recognized it as the legendary bird and national symbol called Chim Lạc, once found on the surface of ancient Bronze Drums and now painted on one of the various street signs you could see all over the city celebrating “30 Years of Progress and Development.” Why did the Colonel seem so invested in that sign? What did Chịm Lạc have to do with Gà Rán? Did you like this post? Then please take the time to rate it (above) and share it (below). Ratings for top posts are listed on the sidebar. Sharing (on email, Facebook, etc.) helps spread the word about diaCRITICS. Thanks! In response to your question, Lady Macbeth would say that reconciliation is only possible for those who have no conscience. Only those who believe that they have no blood on their hands could possibly eat fried chicken with such fervor, correct? You really shouldn’t despair too much about what _Macbeth_ teaches us about the impossibility/possibility of reconciliation in, about, around, and outside of Vietnam 30+ years later. While Lady Macbeth’s guilty conscience drives her to madness and ultimately an untimely death, it is also her most redeeming quality. I am not suggesting that guilt is unequivocally good, but I do think it’s a good thing that water (or maybe chicken grease, in this case) can’t wash away the bloodstained past so easily. Without the “damned spot,” you would never have met the Colonel on that street corner in Ho Chi Minh city in 2008, and the questions you are raising today about the relationship between time and reconciliation, and just as presciently, fried chicken and reconciliation (frightening, really) might never have been voiced. @ Phi Phi, again: Wait, I missed a “damned spot”! That’s Shakespeare (“out, out damned spot”): Lady Macbeth incriminating herself in a dream delirium for the murder of King Duncan. A fitting quote for the irresolvable, the spectral. It’s tough work washing, scrubbing, or soaking out the bloodstained past, after all. @Phi Phi: In that case, we might need to order ourselves a few KFC big box meals and variety buckets, and then some! But you’re absolutely right, Linh Dinh’s poem is indeed about reconciliation (I like yr breaking bread analogy, btw), albeit a deeply ironic, unsentimental, and unsparing representation of what it means to “come to terms” with the past. I think he’s at his satirical best here and I didn’t really “get” the poem (why fried chicken?) 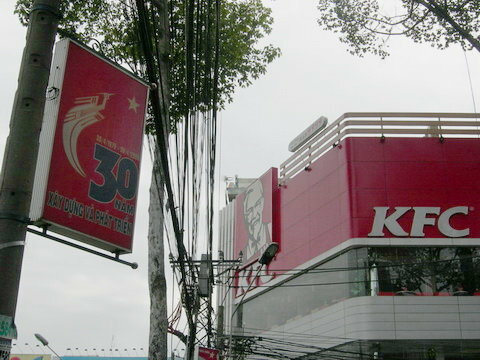 until I found myself standing in front of that KFC in Saigon. For my taste, so much of the postwar literature about reconciliation–from all sides and perspectives mind you–tends to be a little too earnest, sentimental and evasive in ways that I find problematically assimilable into familiar narratives (of national or cultural identity, for example; or the thematics of exile and return). In this context of consolation and catharsis, it’s harder to digest writing like Linh Dinh’s. But I probably just have an unusual taste for the ugly and the grotesque! Question for you and/or others: What do you make of the last few stanzas? In particular, when the speaker of the poem says: “I’m not altogether evil, there are also times / When I refuse to lick or swallow anything / That’s not generally available to mankind”? What’s that got to do with reconciliation? I like the idea of breaking bread (or a KFC buttermilk biscuit) as a symbol of reconciliation. At the end of the meal, we can clean our hands with a lemony scented wet nap (out, out damned spot!) and call it a day.